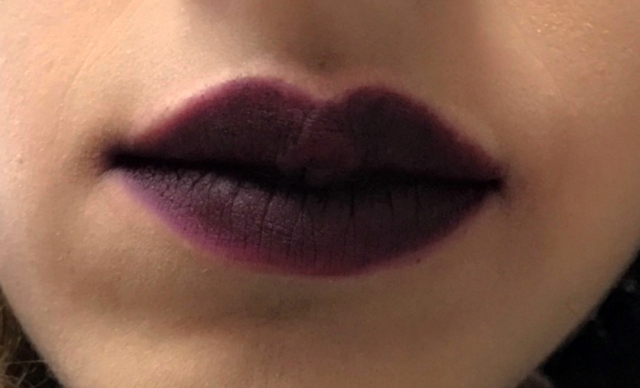 Color : HomeGirl is described as a “matte black cherry.” It’s a deepened, muted dark burgundy-red with cool undertones and a matte finish. What it is: An innovative lipstick that coats lips with bold color, long-lasting wear, and luxe comfort. What it does: Drench your lips with bold color and unstoppable femininity. Designed to look as rock ‘n roll as its wearer, this revolutionary lipstick is formulated with Color Cushion Technology™, which combines lasting-wear, one-swipe payoff, and velvet-touch comfort. This color-true lipstick leaves lips supple, and its wide color spectrum offers stunning shades, including red for every skintone, statement-making colors, and classic, everyday neutrals. What else you need to know:Kat Von D’s Studded Kiss Lipstick is infused with an antioxidant complex that leaves lips feeling soft, and the Crème Brûlée scent provides a subtle, sweet experience when you apply it. Designed by Kat to resemble one of her favorite bracelets, the black, monochromatic casing is uniquely studded and topped with her KVD monogram on the outer crown and bullet. Packaging : The packaging of Kat Von D studded kiss lipstick is just Stunning! Its so chic and feminine . It looks as if small spikey studs are embossed all over the tube. The KVD logo is engraved at the top of the cap and on the bullet too. The shade is mentioned at the bottom of the tube. The only thing I do not like about the packaging is the cap! It tends to open very easily and doesn’t feel secure enough to keep it the bag. Texture : The formula claims to have “one-swipe payoff” with 10-hour wear, But the color coverage is really disappointing. It gives semi-opaque and uneven coverage. The consistency of the lipstick is very stiff and dry and it tug a lot on the lips. The color is so drying it gets distributed in patches that is darker in some places and lighter in others. Pigmentation & Lasting : The color wears for around six - seven hours and does transfers alot. Overall : I did not like this lipstick at all. I have heard great reviews for KVD may be I have to try some other famous shade to change my view of the brand.